Big bands – why do the men get all the glory? Open your ears people, because these women should be heard. When you think of big bands the names Glenn Miller, Count Basie, Benny Goodman, or Duke Ellington often pop up as the usual suspects. 1930s-’40s America was the stage set for the era of the big bands, and there were hundreds of them across the US at the time, swinging and jiving their way into the national consciousness and hitting, essentially, the big time. This was all very well for the guys leading the bands, but what about the girls? In a time when segregation and sexism were rampant, female bandleaders, both black and white, had something of a struggle on their hands to get their voices heard. Most female performers were usually only relegated to vocals, and playing an instrument was almost unheard of, with a few notable exceptions. But the ones that broke through did it as good as, if not better than the guys. 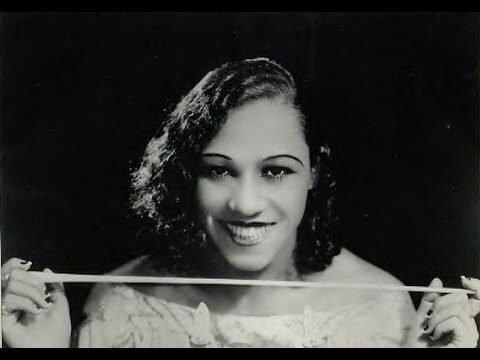 Lil Hardin Armstrong is at the top of my list, and it seems not to be common knowledge that not only was she was an incredibly gifted musician and composer, but also a bandleader, and if it wasn’t for her the world might not have had the great Louis Armstrong. Growing up in turn of the century Memphis, Tennessee, she learned piano, and played mostly hymns and spirituals. But that ol’ devil Jazz was knocking on the door, and she readily answered the call. It wasn’t long before she joined “King” Oliver’s band in the 1920s, and it was here that she met a young Louis Armstrong. Funnily enough, she wasn’t that impressed with Louis at first, but recognising the immense talent of the man, decided to clean up his act a little, and put him up front where he belonged. They married in 1924 and many of Louis’ hits of the time were penned by her. Struttin’ with Some Barbecue was one that is still played today by jazz bands all over the world. By the 1930s the marriage had failed, and she went off and formed her own band, an “All Girl” Orchestra, which was a bit of a misnomer – it was actually mixed gender – and she enjoyed mild success with radio broadcasts and recordings for Decca. Let’s have a listen to Lil Hardin Armstrong and her Swing Orchestra in 1936. Hot stuff! It seems that swine Racism was responsible for her downfall. Playing to a segregated audience, Blanche was arrested for using a “whites-only” bathroom, and the band soon fell apart. Not yet totally disgruntled with the music biz, she went on to form an All-Girl Orchestra in 1940, which sadly didn’t last very long. Instead, becoming involved with politics, Blanche made another historic first in 1958 – she was the first African-American woman to vote in Florida! Ina Ray Hutton was also the inspiration for another all-girl orchestra which hit the scene in the 1940s, The International Sweethearts of Rhythm. Founded by school Principal Dr Laurence C Jones of Piney Woods Country Life School in Mississippi, a school for orphaned African-American children, the International Sweethearts of Rhythm, as the group came to be known, owing to the fact that all the band members were of mixed race, took off in 1941 and perhaps was another first in the wildly racist and sexist world of the time. Through the 1940s, although hugely successful and touring across the country and also Europe, they too were at the mercy of the harsh segregation laws in the Southern US states. As a racially mixed band, the South made life on the road very difficult, and staying in a motel was totally out of the question. Consequently they often had to live out of their tour bus. And people say musicians have an easy life… Have a listen to leader Anna Mae Winburn fronting the International Sweethearts of Rhythm. Talk about girl power! So let’s celebrate the women in jazz, and not just the singers. We all love a bit of Bessie Smith or Sarah Vaughn, but we must pay homage to the female players as well, and it seems there were a surprisingly large amount of them. These brave souls stood up to the face of racism and the blinkered idea of “the woman’s place”, writing themselves into the history books in the process. Stars like Ella Fitzgerald notably led the Chick Webb Orchestra after Chick died, and this was a bit out of the ordinary. Thelma White led an all-girl orchestra entertaining the troops during World War II. Helen Lewis and Her All-Girl Jazz Syncopators also graced the stage in the pre-war days. Get out of the way, Glenn Miller, here comes a real band! Go girls!